A gold compass rose is surrounded by slices from eight different landscapes. 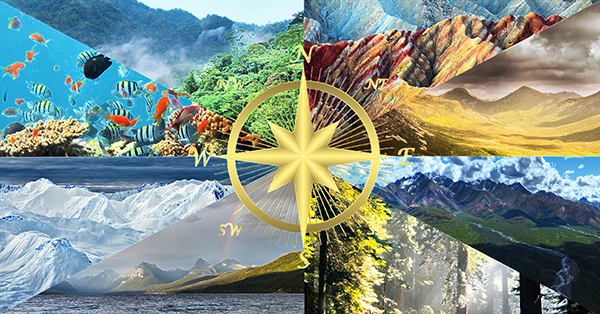 Clockwise from the upper left they are: a rainforest, a desert with red stripped hills, a grassy plane surrounded by mountains, red mountains, a temperate forest, a lake with a rainbow, snow covered mountains, and an underwater view of a coral reef. Crossroads is a land of diverse peoples and geographies. In addition to humans, many nonhuman peoples call Crossroads home. From elves to merfolk, vampires to fairies, and trolls to talking animals, each species that lives here has as much cultural diversity as humans do. And all of this diversity creates lively trade, both between the different regions of Crossroads and with those outside of its borders. In the past there were many wars, but now a unified kingdom spans the land. However these past wars have left many magical hazards. The presence of these hazards has led to the development of professional adventurers, individuals and groups who are called on to address a wide range of problems, both large and small. And new problems are arising all of the time because the magic of Crossroads has a tendency to go awry. You see, this world is woven from threads of magic. Many of the people living in Crossroads have the ability to manipulate these threads and change their pattern. Unfortunately, making changes to the threads requires the magic user to unweave a small piece of reality. Unwoven magic is unstable and comes with serious risk. Unexpected results are common. Crossroads also has many unusual magical features—a series of lakes that hover in the air, mountains covered in forests of giant flowers, and hidden gateways to the beautiful and dangerous Other Realm. Perhaps the most important magical feature is the Ring of Mist that encircles all of Crossroads. This mist prevents magic and knowledge from crossing in or out of Crossroads. However people and mundane items can freely come and go and many traders pass through the Ring of Mist every day. Crossroads Cosmology and Foundations: This discussion gives depth to many of the unique features of the Crossroads Setting. Starting off with the creation story that explains its unpredictable magic, this section also explores the mysterious Ring of Mist that surrounds Crossroads and the many theories of creation which provide a range of story hooks and avenues for connecting Crossroads to other settings. The Other Realm: Inspired by mythology of the fairy realm and the fey, the Other Realm is a fragment of the First Creation that escaped its destruction. This beautiful and dangerous place connects to Crossroads in a few magical gateways. Anyone able to find one of these gateways can cross into the Other Realm, but be warned, the Other Realm is shaped by the will of its Three Rulers and it follows its own laws. Crossroads Character Creation: This is a character creation sequence for the Magic Goes Awry game system that is specific to the Crossroads setting. Currently this comes with five different mini adventures that can each be played immediately after character creation. The Geography of Crossroads: Coming soon! The Peoples of Crossroads: Coming soon!